God Bless the USA ... and trendy cupcakes. This Wednesday marks not only the first day of July, but the introduction of a new set of seasonal cupcake flavors to Georgetown Cupcake (1209 Potomac St., as if you didn't know). 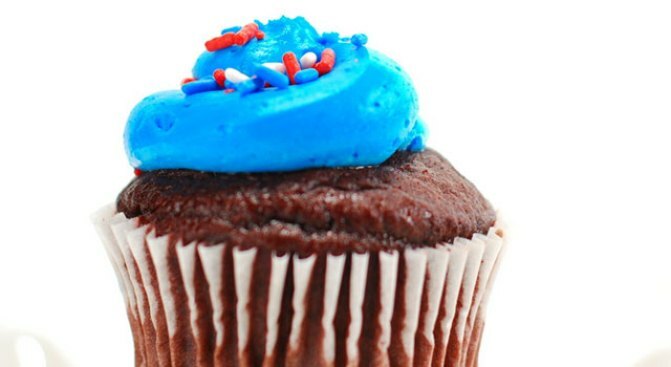 We're getting all patriotic thinking about that red, white and blue icing -- uh, flag! We meant flag! Yeah. Add flair to your Independence Day barbecue with heaping mounds of sugary goodness, in season-appropriate colors and flavors. July means you can now get the confections in strawberry, blueberry cheesecake or Fourth of July-themed. And listen, we know you just want to start scarfing ASAP, but they're $2.75 apiece, so nosh accordingly. Can't get to Georgetown on the Fourth? We wouldn't want to combat all that tourist traffic in this humidity either. No need to panic. The Independence Day cupcakes will be available throughout the holiday week, and by special order throughout July. We don't know what better way to say "Happy Birthday, USA" than with designer cupcakes. They're not a constitutional right, but they should be. YUM.